A Total Eclipse of the Sun is spectacular. Anybody who has experienced nature's most awesome and unusual phenomenon never forgets it. We have met people who have seen total eclipses by accident and their reaction is always one of amazement. Although the entire eclipse can last for a couple of hours, the spectacular total phase lasts only for a few minutes. The maximum duration of totality is just over seven and a half minutes. For any one location, total eclipses of the sun occur rarely; on average, once every 410 years or so. In our home city, London, the last two total eclipses of the Sun occurred in the years 878 and 1715; the next is not due until 2151! In a larger area, they are more common. For England, the last was in 1999 and the next in 2090. For the Earth as a whole, total solar eclipses occur roughly seven or eight times every ten years. If we are to see one we must travel. Kryss has now experienced thirteen; Talaat ten. Two of those were clouded out but were still worth being present for. Total Eclipses of the Sun occur when the Moon passes in front of the Sun blocking out its light for a few minutes. The sky darkens, the air cools, birds and animals react, and unusual colours bathe the landscape. Because they occur so infrequently, the event is a new and unknown experience for the local people. The reactions of a community awaiting an eclipse are part of the interest for us. Professional astronomers arrive at a site, prepare their equipment, observe the eclipse and leave. Unlike them, we like to be there at least a week before to feel the mounting excitement. Kryss always enjoys buying eclipse t-shirts and now has quite a collection. The path of totality is a long narrow strip, usually less than 200km wide. It snakes a third of the way around the globe. Usually less than 1% of the Earth's surface is bathed by the shadow, or umbra, which most often passes over sea or uninhabited land. Only observers within this narrow band will experience totality. Outside the path of totality, a partial eclipse is visible. Partial eclipses are less interesting, with little to see. Even if an eclipse is 99%, the spectacular phenomena of Totality will not be seen. Fred Espenak (in association with NASA) supplies information and maps of these paths of totality. We use these as our travel brochures! There are four types of solar eclipses. When the Moon's shadow misses the Earth but passes very close to it, only a Partial eclipse is visible. These types of eclipse tend to be visible away from the tropics. When the Moon's shadow hits the Earth and the Moon is close to the Earth, then a Total eclipse is visible along the narrow path of Totality. (A Partial eclipse occurs on either side of the path of Totality). For a Total eclipse, the Moon can appear to be as much as 6.5% larger than the Sun. The maximum duration of Totality is 7m 31s. Eclipses over seven minutes long are rare; only three occurred during the 20th Century and none will happen in the 21st Century. Longer eclipses tend to occur nearer the tropics. When the Moon's shadow hits the Earth but the Moon is far from the Earth, it will not be large enough to cover the Sun completely. A ring of Sun remains around the Moon. This ring-shaped partial eclipse is called an Annular Eclipse (from annulus the Latin for ring). At its most extreme, the Moon can be 10.9% too small to cover the Sun. The maximum duration of Annularity is 12m 30s. A Hybrid Eclipse is where the Moon is at such a distance that the eclipse is Annular in some areas and Total in other areas. The duration is usually very short for these types of eclipses. In any calendar year there must be TWO solar eclipses and there can be as many as FIVE. Less than half will be Total. The table below shows all Solar Eclipses occurring between 2010 and 2030. The next ten Total eclipses are described in detail below. All types of eclipses occur when the Sun, Moon and Earth are in almost exact alignment. Their motions are such that they almost repeat after approximately 18 years 11 days and 8 hours. This period is known as the Saros. If an eclipse occurs, a similar one will happen after one Saros. 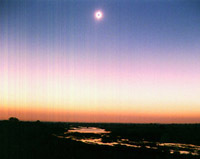 The long total solar eclipse eclipse of 11 July 1991 is followed by another on 22 July 2009. The extra 8 hours of the Saros period allows the Earth to spin a third of its daily rotation, a turn of 120 degrees. This means that the 1991 eclipse was total in the Eastern Pacific and the Americas but the 2009 eclipse was total in Eastern Asia and the Western Pacific, 120 degrees to the West. Eclipses related in this way are said to belong to a Saros Series. The repeat of the Sun, Moon and Earth every Saros is not exact, however. The path of totality moves either north or south. Given enough time the location of the eclipse slowly drifts and will eventually leave the Earth. Each eclipse belongs to a Saros Series which is given a number. As an example we will examine the properties of Saros Series number 139. Saros Series 139 began on 17 May 1501 with a small partial eclipse visible over one of the northern polar regions. The Moon's umbra missed the Earth but passed close enough for a small partial eclipse (covering 9.1% of the Sun) to be visible. The next eclipse in the Saros Series occured 18 years 11 days and 8 hours later. The Moon's umbra passed closer to the Earth than the previous eclipse but still not close enough to produce a total eclipse. It was a slightly bigger partial eclipse (23.5%) at the same pole on 28 May 1519. Each successive eclipse was partial but of increasing magnitude. Eventually after seven partial eclipses, the umbra hit the Earth producing a hybrid eclipse around the same northern polar region on 11 August 1627. The duration of totality was very short: 0m 01s. The type of eclipse depends on how far the Moon is from the Earth and at this time the Moon was too far to make a purely total eclipse. Saros number 139 continued with each successive eclipse moving closer to the equator and with the Moon moving closer to the Earth. This produced a series of 12 hybrid eclipses, the final one on 9 December 1825. The duration of totality was 1m 34s. The next eclipse (21 December 1843) was total along its entire path (duration 1m 43s). The eclipses continued moving south towards the equator and getting longer. On 18 March 1988, the 28th eclipse of the series occured in the Pacific Ocean. 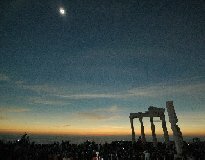 A totality of 3m 22s (from a maximum of 3m 46s) was observed by Kryss in the Philippines. 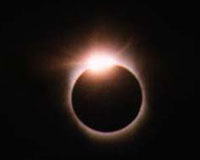 The 29th eclipse of the series occured on 29 March 2006 across Africa and Eurasia and was seen by Kryss and Talaat from Turkey. On 13 June 2132 the middle eclipse of Saros 139 will occur. The duration will be 6m 55s. After this the successive eclipses will cross into the southern hemisphere. They will continue to increase in length until 16 July 2186 when totality will last for 7m 29s, only two seconds short of the maximum theoretical length. This Saros will produce five eclipses longer than seven minutes. The total eclipses continue to move south but now decrease in length. The final total eclipse of the series will occur on 26 March 2601. After that there will be nine partial eclipses in the southern polar regions ending with a small partial eclipse of 5.8% ocurring on 3 July 2763. Saros 139 began on 17 May 1501 and will end on 3 July 2763. It will last 1262 years and produce 71 eclipses comprising 43 totals, 12 hybrids and 16 partials. As of 2017 there are 40 solar Saros series active. The latest (Saros 156) began on 1 July 2011. Saros 117 will end on 3 August 2054. This table summarises the Total Eclipses of the Sun that have been seen or experienced by Kryss Katsiavriades. 17 21 August 2017: Fields Creek near Casper, Wyoming, USA. 16 9 March 2016 : Tete B Village near Ampana, Sulawesi, Indonesia. 15 20 March 2015 : Torshavn, Faroe Islands, Denmark. 14 3 November 2013 : Pokwero Village near Pakwach, Uganda. 13 14 November 2012 : Machans Beach near Cairns, Australia. 12 22 July 2009 : Jinshan Beach near Shanghai, China. 11 1 August 2008 : Staribirsk Beach at Berdsk, Siberian Russia. 10 29 March 2006 : Temple of Apollo at Side, Turkey. 9 4 December 2002 : The Kasane to Nata Road, Botswana. 8 21 June 2001 : By the River Ruya in Maname Village, northern Zimbabwe. 7 11 August 1999 : A cliff overlooking the ruins of Wheal Coates tin mine near St Agnes in Cornwall, England. 6 26 February 1998 : The beach at El Pico on the Venezuelan peninsula of Paraguana. 5 24 October 1995 : A ridge near the tiny village of Khanua in the Indian state of Rajastan. 4 3 November 1994 : A hilltop on the Zapahuira plains in Chile's Lauca National Park. 3 11 July 1991 : A ridge near the village of Santiago in the south of the Mexican peninsula of Baja California. 2 18 March 1988 : The city hall roof of General Santos City on the Philippine island of Mindanao. 1 11 June 1983 : A children's playground on the beach at the village of Tuban on the Indonesian island of Java. Maps and summaries of the next ten total eclipses of the Sun and some eclipse facts and figures. A table of the solar eclipses seen by Kryss Katsiavriades. A series of thought provoking essays on astronomy including a monthly sky page for the UK. More travel stories and photos from around the world can be found here. A fascinating eclipse and astronomy site with excellent historical accounts of eclipses and contributions from eclipse chasers. Small or large amounts of CE approved eclipse glasses as used by the BBC. Place your company link here on this popular page.